Mt. Huashan is well-known for its precipitous crags, narrow and steep paths. 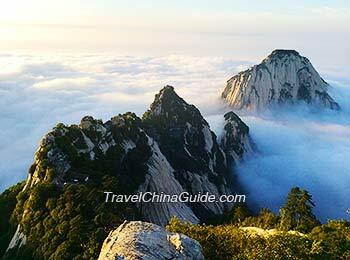 Today our Xian to Huashan day tour will take you to see the natural vista of this mountain. In the morning, our guide and driver will pick you up from the hotel booked on your own at the appointed time and transfer you to Mt. Huashan. The trip takes about 2 hours. Upon arrival, we will start our Huashan tour by taking tourism bus and transit to a cable car to approach the North Peak at an elevation of about 1,614 meters (5,298 feet). With our guide’s company, you can hike southward from the North Peak and pass through the Ear-Touching Cliff, and then you will see a long and narrow ridge called Canglongling (Black Dragon Ridge) - one of the most famous steep paths on Mt. Huashan. After that, we will return to the North Peak in order to get down the mountain by cable car. At the end of this Xian to Huashan day trip, we will take you back to your hotel. Due to the limited conditions on Mt. Huashan, we cannot arrange lunch during your visit. We advise you to have a good breakfast, and then take along some snacks such as bread, biscuits and chocolate for yourselves. There are four peaks on Mt. 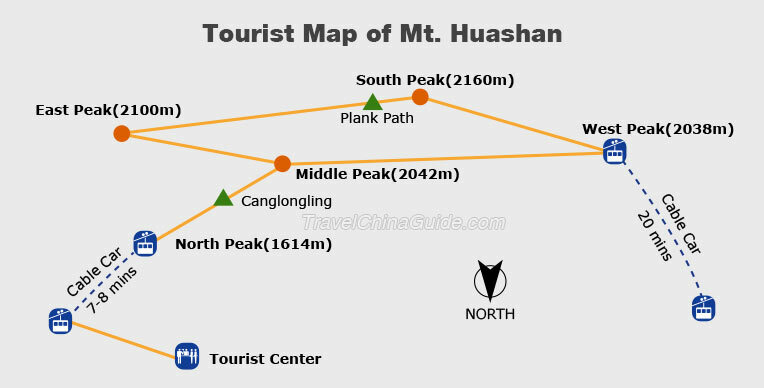 Huashan: East Peak, South Peak, West Peak and North Peak, among which the South Peak is the highest point. If you intend to get to the South Peak, we advise you to go up to the West Peak by cable car firstly, and then hike around 30 minutes to approach the summit. This route is suitable for travelers who are not physically fit but want to enjoy the splendid and dangerous landscapes above Mt. Huashan. However, we kindly remind you that the fare for the cable car of the West Peak is a bit more expensive than for the North Peak. Our travel consultant is happy to arrange that upon your request. The North Peak, also called Cloud Terrace Peak, is surrounded by cliffs on three sides. It is the best place to have a bird’s eye view of the other three peaks in Mt. Huashan as well as the Black Dragon Ridge - a blade-like ridge, standing straight to sky which looks like a dragon swirling around Mt. Huashan. In addition, the cable car line to the North Peak has around 1,524 meters (0.9 mile) long and the whole ride takes 7-8 minutes. Climbing up the Mt. Huashan is no easy task, but the natural vista is worth of your effort. The West Peak, also named as Lotus Flower Peak, is regarded as the most exquisite and precipitous peak in Mt. Huashan. At the top of it, Lotus Flower Cave - a giant stone which looks like a lotus flower will come to your eyes. Beyond that, you can also see Cuiyun Palace, God Juling’s Foot, Axe-splitting rock and Self-sacrifice Cliff etc. The cable car line to the West Peak is 4,211 meters (2.6 miles) long, and you can reach the top station in around 20 minutes. Is it useful to have hiking sticks or are they not applicable to the type of trails on the mountaintop? If you will climb the Mt. Hua, it is recommended to bring a pair of cotton gloves, because some steep steps may need to climb by your hands. Alpenstock, if used by people who do not often climb mountains, will not be used to, and sometimes become a kind of burden. Hope it helps! hello, i want to know if i can explore part of mt huashan which doesnt do the dangerous path since i was a little scare of height. do you have any advice? I kindly suggest you act according to your physical ability. Famous for its breath-taking cliffs, Mountain Hua may be difficult for people who are afraid of heights. Even taking a cable car also requires overcoming a fear of heights. On the safe side, if you cannot overcome your fear of height, you may cancel this trip. But if you still want to visit, you can climb the mountain at night to avoid seeing the height and only focus on the step. There are iron chains along the road to catch. If you choose climb in the evening, you need to prepare headlight, a pair of comfortable hiking shoes and gloves. Good luck and hope you a nice journey! Hello, I would like to know what is the minimum age for Mount Huashan tour. 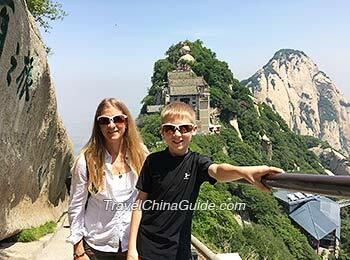 There is no age limitation for guests who would like to join the private Huashan Mountain one day tour. However, considering the safety of guests, we kindly suggest that Children under 12 years of age are not recommended to participate this tour for. Please feel free to contact us should you have any other question. Thanks for your attention. What time will travelers be back at Xi'an? Normally, you will be taken back to your hotel at around 18:00-19:00. As a private tour, the itinerary is flexible, which can be customized based on your request. Please feel free to contact us if you need further help. Thanks for attention.